An incredibly smooth and dynamic rear-entry combined with Korkers' proprietary Flow Foam Fit System™. Designed to keep your foot ultra comfortable, all day long. An incredibly smooth and dynamic rear-entry combined with Korkers &apos; proprietary Flow Foam Fit System™. Designed to keep your foot ultra comfortable, all day long. The OmniTrax Interchangeable Sole System is a revolutionary new concept changing the way people think about footwear. The soles of Korkers shoes and wading boots and cold weather performance boots can be easily changed and customized for a variety of different activities. This innovative technology was created with 3 simple design criteria in mind: ease of use, reliability, and durability. Hundreds of hours of field testing have resulted in a design that is absolutely reliable. All Omnitrax soles are constructed of the highest quality materials, and are fully covered by our warranty. As the only wading boot manufacturer to offer interchangeable soles, Korkers provides an exclusive solution to help protect waters from the spread of invasive species while enhancing angler safety and performance. Through its unique OmniTrax Interchangeable Sole System, Korkers empowers anglers to fish responsibly with a range of specific outsoles, from traditional felt to sticky rubber, that meet the demands of the environment. Korkers extensive use of the Boa lacing system helps set Korkers apart from other traditional lace-up wading boots on the market. The Boa Lacing System was designed to address the long list of deficiencies found in traditional closures and delivers the following benefits completely foreign to traditional laces, buckles, ratchets, velcro straps, and other closures of yesteryear. Glove Like Fit: Boa provides custom comfort with smooth, even closure and no pressure points. Micro-adjustability: Boa reels offer infinite degrees of fine tuning both in and out of the water. On-the-Fly: Get easy, one-handed adjustment with a quick turn of the Boa dial. Fast: Quick on. Quick off. Boa saves time when seconds count. Secure: Once locked into place, Boa reels and laces stay that way. This powerful yet flexible closure allows the ideal amount of flexibility without compromise that will sacrifice performance. No Stretch: Boa delivers a consistent fit, even when wet. Boa laces will not stretch or loosen over time. Easy to Clean: In gritty environments, when muck and grime may collect in lace guides and beneath Boa components, a simple faucet or hose cleaning will help extend the life of your system and ensure it&apos;s ready for next time. 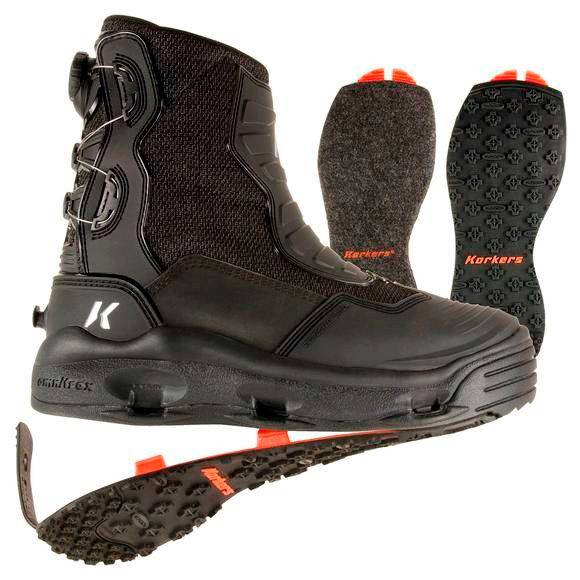 Kling-On Soles: Korkers expands anglers&apos; performance traction options and continues its commitment to combating the threat of invasive species, with the introduction of Kling-On and Studded Kling-On sticky-rubber soles for its line of industry-leading wading boots. Perfect tread for scrambling trails, rock hopping, and wading in wet conditions.